AUSTIN, Texas — Ted Cruz has staged a dramatic about-face on the Trump administration’s “zero tolerance” immigration policies, laying bare how politically damaging the issue of separating children from parents accused of crossing the border illegally is becoming for Republicans facing voters this fall. But he’s softened substantially, telling reporters in Washington on Tuesday, “All of us are horrified at the images we’re seeing.” He said he’s talked with the White House about legislation he plans to introduce to stop the separations, though its exact language hasn’t yet been released. 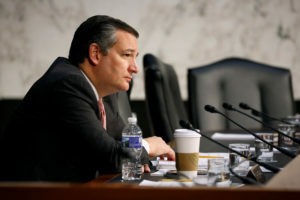 Cruz’s push for legislation comes as Beto O’Rourke, the Democratic congressman giving up his seat to challenge Cruz in November, has moved quickly to criticize the family separations and, in the process, raise his national profile. O’Rourke led a Father’s Day march to a Texas desert tent city which federal authorities hastily erected to house immigrant children. “There’s an open question right now about who we are and what we stand for and what we’re going to do in the face of this injustice and this inhumanity,” O’Rourke said by phone. A former punk rocker, O’Rourke has waged a high energy campaign and often outraised Cruz. He remains a longshot since Texas hasn’t elected a Democrat to statewide office since 1994, but family separation may be proving too thorny a topic even for a Republican facing a relatively easy path to midterm re-election. Nearly 2,000 children were separated from their families in April and May after Attorney General Jeff Sessions announced the new policy that refers all cases of illegal entry — even those when people crossing sought asylum to remain in the U.S. — for criminal prosecution. The government previously limited prosecution for many family entrants, partly because children aren’t charged with a crime and can’t be detained with their parents. Texas is 39 percent Hispanic and has become the epicenter of the debate, with a former warehouse fitted with metal caging in the Rio Grande Valley housing more than 1,000 immigrant children. Roughly 750 miles to the west in the pecan-growing town of Tornillo, near El Paso, more youngsters are being held in the tent encampment where O’Rourke led Sunday’s march. O’Rourke is offering House anti-family separation legislation similar to Democratic-led efforts in the Senate. He’s long courted Trump supporters, saying he can understand their frustration with Washington’s status quo. But O’Rourke says there’s no room for agreement with the White House on this issue.